The influence of Niels Bohr's work, of his approach to research, both practical and theoretical, is widely felt today. His contributions to our knowledge of the atomic constituents of matter and to our view of science, remain of fundamental importance. The publications of his collected works will give historians of science and scientists easy access to a life-work entirely devoted to the rational analysis of the laws of nature and of the singular character of their meaning for us. In addition to Bohr's published papers, the series includes unpublished manuscripts and a wide selection of letters and other documents, with explanatory notes. 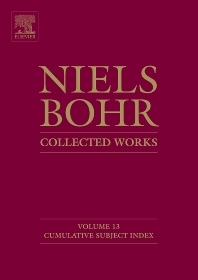 Niels Bohr: Collected Works, Volume 13: Cumulative Subject Index documents aspects of Niels Bohr's varied life and work in the form of a cumulative subject index, with emphasis on his scientific contributions in the field of physics. The general organization of the material is thematic rather than strictly chronological, allowing for the presentation of each paper (or group of papers) along with other relevant material such as drafts, notes, letters, and other items. The book is illustrated with rare photos and includes explanatory notes as well as a bibliography. The bibliography is restricted to the versions of Bohr's publications reproduced in this volume and encompasses a wide range of topics in physics, from the determination of the surface tension of water by the method of jet vibration to the electron theory of metals and of thermoelectric phenomena; the theory of the decrease of velocity of moving electrified particles on passing through matter; the constitution of atoms and molecules; and the spectra of helium and hydrogen. Bohr's other papers focus on the effect of electric and magnetic fields on spectral lines; the quantum theory of radiation and the structure of the atom; the polarization of radiation in the quantum theory; and collisions between atomic systems and free electrical particles. This monograph will be useful to students, practitioners, and researchers interested in Bohr's life and work in general and in quantum mechanics in particular.